Hyperthyroidism is quite common in cats. Acupressure is a healing practice originating in China thousands of years ago, and now it's used across the globe. Although Western medicine may not always adhere to the concept that it works for hyperthyroidism, practitioners who perform acupressure on cats say it works for metabolic conditions like hyperthyroidism as well as many other conditions. Hyperthyroidism is overactivity of the thyroid gland. It occurs when the thyroid produces excess amounts of the hormone thyroxine. The website for Wholistic Paws Veterinary Services, a holistic vet clinic in Hamilton, Virginia, says hyperthyroidism is common in cats and suggest that every cat who is middle-age or older should be tested for hyperthyroidism, particularly if they are experiencing symptoms. They may include weight loss, increased appetite, rapid heartbeat, trembling, brittle fur, bulging eyes and red or swollen skin. Acupressure is an ancient practice originating in China. It promotes the same principles as needle-based acupuncture, focusing on specific energy points in the body. These points are believed to connect with the body's major organs and networks, forming a system of communication within the body. If a point is blocked, illness may ensue; acupressure is designed to unblock the points. Western medicine does not always agree, sometimes attributing acupressure's success to increased circulation or muscle relaxation, according to WebMD. The Mayo Clinic suggests using relaxation techniques to help symptoms of hyperthyroidism, noting they can reduce stress and help achieve well-being. WebMD lists several conditions for which acupressure may be beneficial. These include nausea, pain, stress, arthritis, depression, anxiety and possibly cancer. However, hyperthyroidism is not on their list of conditions. They also note that acupressure is safe but is contraindicated in certain situations, such as tumors or injuries that can be worsened with physical manipulation. HandZenPaws in Santa Barbara, California, offers acupressure for cats. The company's website notes that although some cats may not have the patience to endure a 30- to 40-minute treatment, others are open to the treatment, seemingly recognizing the benefit taking place. They say acupressure can help cats with arthritis, gastrointestinal problems and metabolic conditions like hyperthyroidism. Acupressure.com also discusses acupressure for thyroid health, and notes the acupressure points corresponding with thyroid wellness include the neck, the chest and the base of the throat. 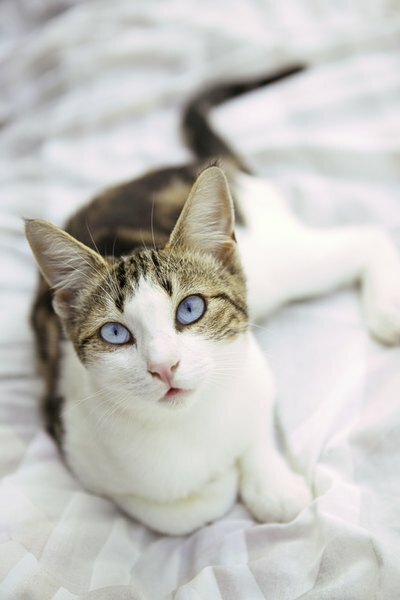 Do Cats Throw Up From Hyperthyroidism?